The name says it all … Gran Cenote is considered one of the best for snorkeling, scuba diving caverns and caves in the Riviera Maya. This cenote is part of the system Sac Aktun, which means white cave in Mayan. The cave diving starts on the edge of a circular shaped cenote with a maximum depth of 10 m. Perfect buoyancy control is necessary because the cavern and cave passages are highly decorated, white-walled, clear water, clear and beautiful formations expected to captivate the diver. 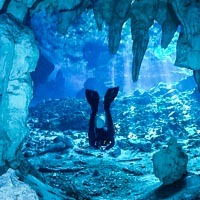 Cave divers can explore various routes within stunningly decorated caves. 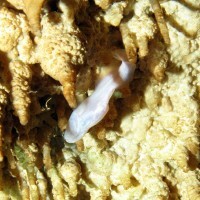 Snorkers can see formations of the area of ​​the cavern from the surface. Casa Cenote connects one of the longest cave systems in the world, Sac Actun with the ocean. It is one of the few surface rivers in the Yucatan peninsula. The dive follows the course of this river to a depth of not more than 8 meters, and due to the connection with the ocean, fresh and saltwater are present. A variety of freshwater and saltwater fishes including barracudas and tarpons can be spotted here. Going quietly to the surface near the end of the river, you will see many species of birds and with luck you might see an osprey. On the sides there are small caves openings into the jungle, often used by manatees, inhabitants of rivers and coastal lagoons. The diving continues along the jungle and at times through algae covering the mangrove roots reaching the water. Large rocks with moss and seaweed decorate the background. It is perfect for beginners for its easy and calm conditions. A deep dive with a sulfur cloud at 30 meters and with unlimited visibility gives this dive a special atmosphere. Descending through clear water you will sink right into a mystical layer of hydrogen sulfate that looks like a giant cloud with logs and branches passing through it. Under the cloud the salt water begins, but is dark and gives the diver a feeling of being in a forest at night. Depending on air consumption, the rise can be done slowly along the walls with some large stalactites hanging from the edge of the cenote, and can be admired with reminders of when the water level was much lower. Angelita is a dive for experienced divers due to its depth, this dive is usually done with 35 meters maximum depth. 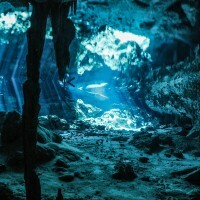 This cenote is also popular for technical divers and decompression dives. The Temple of Doom, also known as the cenote Calavera, is completely different from other caverns in the area. The input passes through a circular hole in the rock surface and the adventure begins almost immediately as you have to jump about 3 meters to the water surface. The area of ​​the cave is a huge room with a pile of collapsed sediment and rocks in the center. During the dive, divers make their way around the hill, diving at different depths along the walls of the cenote. There is enough light in the cave and many fossils to be discovered. Look towards the entrance and imagination can recognize the “Skull”. The light passing through holes in the sky creates an effect of two eyes and a mouth. 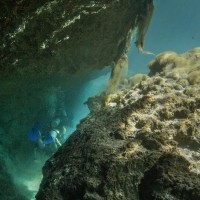 For cave diving, there are beautiful passages in different directions. Ask your guide for “The Fang” an impressive combination of giant stalactites and stalagmites, and the effects of the halocline where the fresh water mix with the salt water. 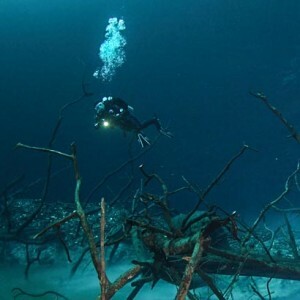 The name Dos Ojos originates from the two circular cenotes which are located close to each other. Dos Ojos is known for its several shallow dives and gives the diver enough time to appreciate this beautiful system with unlimited visibility and fantastic light shows. The snorkeling in Dos Ojos cavern is mainly near the entrance of the second eye which is filled with daylight. 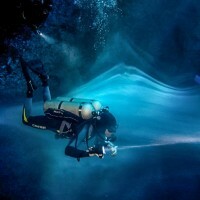 The bat cave is the darker of the two dives at Dos Ojos system. It is a series of rooms and passages under the bat cave where only a small amount of light enters. 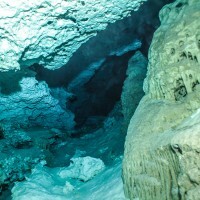 Cave divers can plan dives and continue many miles in different directions in this extensive cave system. 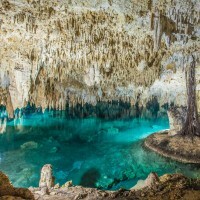 With about 60 km of explored caves and connecting over 25 cenotes, Dos Ojos is one of the longest systems in the Yucatan Peninsula. This cenote has a small opening at the surface compared to what it offers below. A jump of 6 meters or 18 feet into the water will take you to another world. Rays of bright turquoise light for more than 30 meters or 100 feet reach straight down. Unlimited visibility, a cloud of hydrogen sulfate, anthropological remains and cave formations make this cenote an experience unlike any other. The Pit was discovered in 1996 by cave explorers who came all the way from the main entrance, something like 1500 meters / 5000 feet away. The passage includes the deep room Wakulla, the passage after the main base, Jill room and the passage of the next generation. The Pit is part of the system Dos Ojos, and contains the deepest cave passage known in the state of Quintana Roo, Mexico with 130 meters / 400 feet deep. The bumpy road heading into the middle of the jungle has kept this place from being overrun by a high number of divers. This medium-advanced shallow dive has caverns that are beautifully decorated with stalactites and stalagmites in great numbers. Some narrow passages make this dive more demanding in terms of buoyancy control. The highlight of the tour comes during the second dive when you arrive at the “Hall of Mirrors” a room covered in thousands of stalactites hanging from a massive black mirror on the ceiling of this huge room. It’s simply breathtaking. One of the most remote cenotes, at the end of a dirt road is definitely the most challenging of our dive sites for cavern diving. It offers a maximum depth of 6 meters but the shallow parts with a depth of one meter make the dive quite tricky. Pet cemetery is part of the Sac Aktun system which is easily recognized by the white marble color of the thousands of stalactites with different shapes. For someone curious about stalactites formations, this place is of great interest; stalactites here are incredibly numerous and varied, some even grow horizontally.